Weather permitting, the Ruffian will be run at Belmont this afternoon. 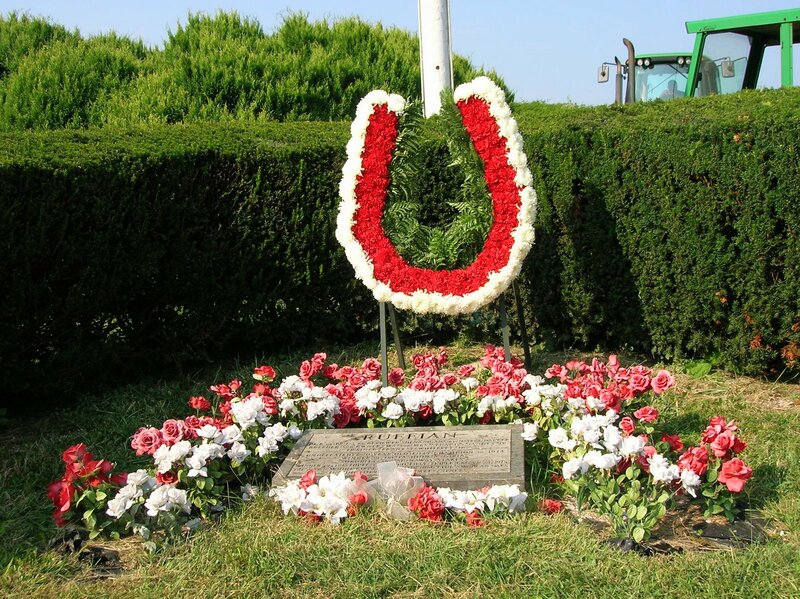 With fresh flowers on Ruffian’s grave in the infield, nine fillies will go to the post to contest the mile and a sixteenth race on the dirt. The race used to be the second in the Belmont fall filly series, the first the Maskette (later re-named the Go For Wand) and the third the Beldame. In 1985, Lady’s Secret won all three races, beating older fillies and mares, becoming the first filly to sweep the series; in 1986, she did it again en route to being named Horse of the Year. She’s still the only filly to have won the fall filly triple crown. As a three-year-old, this daughter of Secretariat battled with Mom’s Command for preeminence in the division. The latter had swept the filly triple crown series, a/k/a the Triple Tiara (the Acorn, Mother Goose, Coaching Club American Oaks), but Lady’s Secret dominated the fall, and Mom’s Command’s injury and subsequent retirement in the fall of her three-year-old season brought their rivalry to a premature close; each filly beat the other once, with Mom’s Command taking three-year-old filly honors in 1985.
like a champion on her way to a race. Earlier in 1986, she had beaten boys in the Whitney, finished second in the Woodward, and finished third in the Iselin and Met Mile. While considered a cinch for champion older filly, those losses to colts created skeptics about her worthiness as Horse of the Year. Lady’s Secret was inducted into the Hall of Fame at the National Museum of Racing in 1992; she was euthanized in 2003 following complications from foaling. She earned more than $3 million in her career, and while not leaving much of a legacy as a broodmare, her hoof prints in the history books are far more significant than any offspring she might have produced. Today at Belmont, we’ll watch such as notable fillies as Miraculous Miss, Boca Grande, and Tough Tiz’s Sis race; none reaches the stature of Lady’s Secret, a once-in-a-lifetime filly. Here’s her 1985 Ruffian, and below, you’ll find her 1986 Breeders’ Cup win–which of course was run on Saturday, with all the other Breeders’ Cup races. This year, if you want to watch the impressive fillies and mares, you’ll have to do it from work or take the day off…or, you can sign our petition to express your displeasure about the changes in the scheduling and name of this year’s distaff races. Take back the race! I think the BC is unaware that the true Lady’s Secret is that, this year, the Distaff Division is the best division in racing.I usually pull a few friends together, kicking and screaming, and throw a sizeable pick Six ticket together. The BC is not getting my money this time around.